Multipurpose bowls/dishes with excellent quality. Irreplaceable healthy porcelain ramekins, LEAD FREE. As a ramekin, it can broil shrimp scampi, bake hash brown nests for eggs, individual baked desserts or quiche, warm dishes in microwave, oven. dipping sauces for chicken nuggets, melted butter for crab legs or lobster. Easy to stack for efficient storage. 1)DO NOT cut food on porcelain product. Sharp objects may scratch porcelain. 2)Oil stains on porcelain product can be removed easily by loofah sponge with cold water after having been soaked into hot water for a little while. 3)When porcelain product is not in use, clean thoroughly and store it in a dry environment. 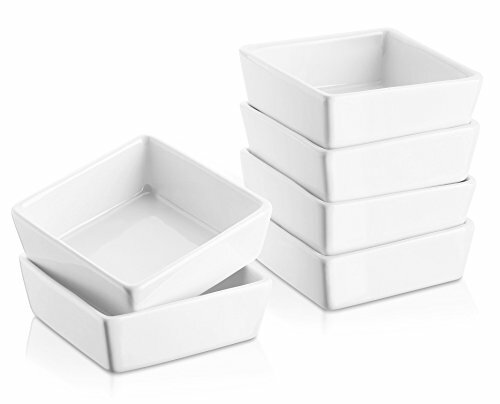 WHAT YOU GET: 6 pcs Stylish square white porcelain ramekins/mini bowls/souffle dishes; Excellent for your baking or dipping in your kitchen, dining room, restaurant or your cating company. PERFECT SIZE: Capacity-6 oz, Outside dimension of the ramekins is measured 3.5"(L) x 3.5"(W) x 1.3"(H). Suitable for serving dips, salsas, ice cream, dessert, condiments, dressings, sauces, appetizers, candies, side dishes like olives and bruschetta, etc. GO WITH ANY LIVINGWARE: Classic white porcelain ramekins go well with any color dinnerware and table settings, also looks fantastic in any setting. Believe that you won't turn down the chance to make your kitchen beautiful.